Traveling to Shirdi for a pilgrimage with your family or for a short trip with your friends, Hotel Anand Palace will served as the perfect accommodation choice for you. 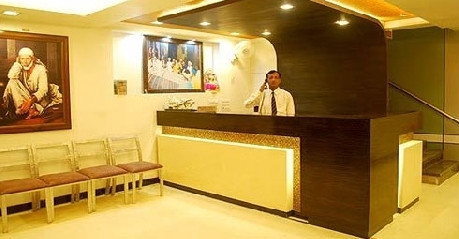 Anand Palace Hotel is a budget property located Nagar- Manmad Road and therefore offers easy connectivity to major commercial centers and nearby shrines in Shirdi. The hotel offers well-furnished and clean accommodation options that too at a very reasonable price, which has helped it garner huge and loyal clientele. On accommodation front, the Anand Palace Hotel offers Two Bedded Rooms, Three Bedded Rooms, Five Bedded Rooms and Nine Bedded Rooms; to cater to diverse requirements of patrons. All the rooms are furnished with premium materials and include modern day amenities to keep clients pampered and satisfied during their stay here. Apart from the accommodation, the Anand Palace Hotel also houses a multi cuisine restaurant that serves an array of delectable dishes from different corners of India and world. The food is prepared in strict hygiene conditions using organic ingredients and rare spices, which brings out unique flavor of dishes. If you are in a hurry or in mood for some light snacks, you can order your favorite pizzas from the Domino’s outlet situated right below the hotel premises. Other facilities and services provided by Hotel Anand Palace include high speed internet access through Wi-Fi, laundry facility, board room for corporate events and meetings, travel desk, airport/railway station transfer, parking facility and many more. Budget pricing and comfortable accommodation options, make Hotel Anand Palace a very convenient place to stay for your visit to Shirdi. 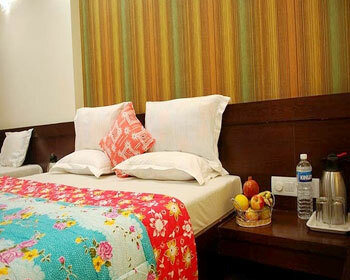 Two Bedded Rooms are the simplest and most basic accommodation option offered by Hotel Anand Palace, Shirdi. 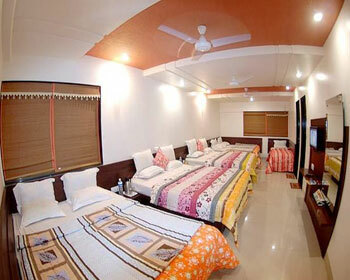 The rooms are aimed at solo travelers, business guests and coupled; who are visiting Shirdi. The rooms are designed by expert architects and fashioned by expert designers keeping in mind diverse requirements of modern day travelers. As the name suggests the two bedded rooms are equipped with two separate bed, seating unit and wardrobe to keep things organized for patrons. The interiors are designed in line with the contemporary design theme and reflects cheerful ambience. Other facilities provided as part of Two Bedded Rooms include LCD television with remote control and satellite connection as well as subscription for premium channels, telephone unit with intercom facility, soft quilts, hot and cold water availability (limited hours), bathroom toiletries, private attached bathroom, round the clock room service and many more. Budget pricing and lavish comfort features make Two Bedded Rooms stand out and apart from other accommodation options available in Shirdi. 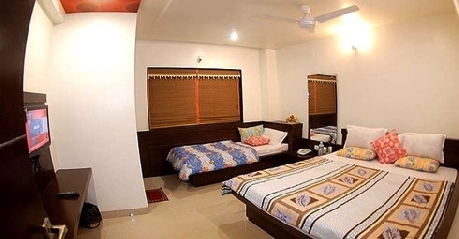 Looking for a comfortable and affordable accommodation option in Shirdi, then the Three Bedded Rooms provided by Hotel Anand Palace would be ideal for you. These Rooms are designed by expert architects keeping in mind varied requirements of modern day travelers. The Three Bedded Rooms come equipped with three comfortable beds with lavish mattresses along with a wardrobe and seating unit. The room sports very classy ambience that is enhanced by the simple yet elegant interiors of the Three Bedded Rooms. 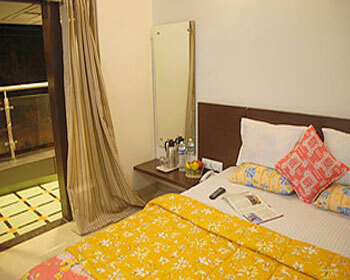 Patrons can also be sure of being pampered by best of modern amenities and facilities during their stay here. The notable among them include. LCD television with remote control and satellite connection as well as subscription for premium channels, telephone unit with intercom facility, soft quilts, hot and cold water availability (limited hours), bathroom toiletries, private attached bathroom, round the clock room service and many more. 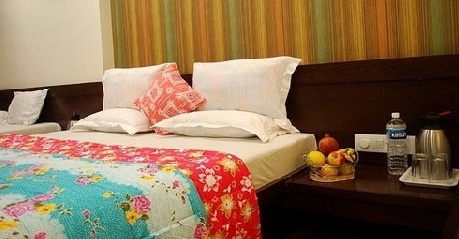 Ideal for small groups and families, the Three Bedded Rooms are sure to cater to all requests of patrons easily. Planning a pilgrimage trip to Shirdi with your family? 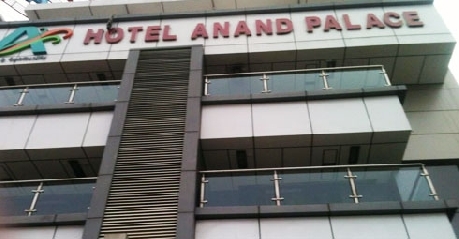 Then you might need an accommodation option that offers ample amount of space and basic amenities to cater to diverse needs of all members of your group, Worry not, Hotel Anand Palace has just the kind of accommodation you need in the form of Five Bedded Rooms. The Five Bedded Rooms are specially crafted for guests who are traveling with a group and need extra space. Apart from the five comfortable beds, the room also includes two lavish bathrooms, seating unit and wardrobe facilities. The room is designed by experts keeping in mind diverse requirements of the guests and therefore caters to all major and minor requirements of the clients. Other facilities and features included in the Five Bedded Rooms include LCD television with remote control and satellite connection as well as subscription for premium channels, telephone unit with intercom facility, soft quilts, hot and cold water availability (limited hours), bathroom toiletries, private attached bathroom, round the clock room service and many more. 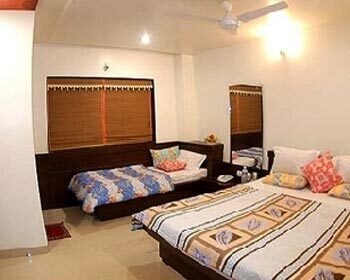 Aimed at group travelers, who are visiting Shirdi for pilgrimage purposes, the Nine Bedded Rooms are designed to offer ample space and comfortable accommodation choices to guests. The Nine Bedded Rooms are designed by experts as per modern décor theme, which is clearly reflected in the charming interiors complimented by local cultural artifacts. Apart from the dormitory style nine beds, the rooms also incorporate two attached bathrooms, seating units and wardrobes for the convenience of clients. Nine Bedded Rooms are fitted with best in class amenities and features such as LCD television with remote control and satellite connection as well as subscription for premium channels, telephone unit with intercom facility, soft quilts, hot and cold water availability (limited hours), bathroom toiletries, private attached bathroom, round the clock room service and many more. 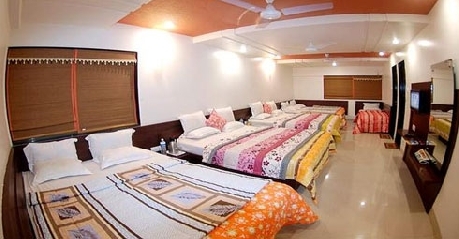 The classy setup and ample space offered by the Nine Bedded Rooms, make them stand out and apart from any other accommodation option available for groups in Shirdi city. Treat your taste buds to best flavors and exotic dishes, by choosing to dine at the on site multi cuisine restaurant of Hotel Anand Palace. The restaurant is located on the premises of the hotel and therefore offers easy access to scrumptious and healthy food without the need to venture out of the hotel. The diner has very simple yet elegant décor that is adorned with local cultural symbols and artifacts. The charming interior of the restaurant provides it very opulent ambience making dining here a very memorable experience. On the menu of the restaurant, patrons will find an array of delicacies ranging from Gujarati, Punjabi, north Indian, south Indian, Chinese and continental items. If you are in a mood for a quick bite, you can also order fast food items like Pav Bhaji, Pizza, fresh fruit juices, ice creams and much more. The restaurant also follows very strict hygiene and cleanliness policy that inspires confidence in the quality of the food served here.